It’s Blue Monday. Apparently it is the most depressing day of the year as Christmas is over, the decorations are down and the reality of an empty bank account sinks in. We’ll ignore that this was first cooked up as a marketing promotion a few years ago to encourage the population to start booking sunny summer holidays when it was cold and wet outside, and use this as an excuse to make something that brings us some flavours of the Mediterranean when the skies are heavy and grey. To do this, I’ve decided to revamp my take on Spanish magdalenas (and you can read the original post here for all the background and history). 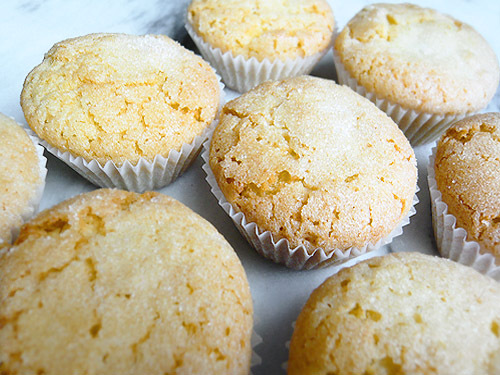 These are lovely little cakes made with lemon and olive oil, just the sort of thing to have at breakfast with a cortado or a café con leche. I mean, perhaps this is not how Spanish people eat them, but I’ve eaten them on holiday in Spain, and when you’re on holiday, it is completely legitimate to eat cake for (or at least with) breakfast. But why a revamp? Am I not a fount of new ideas? Generally I like to look around for inspiration to try new things – it might be discovering a novel ingredient, going on holiday, or acquiring an unusual kitchen implement, all of which are usually pretty good ways to come up with ideas. I’m generally not one for making the same recipe over and over with a different flavour or icing on top. However, I recently started to look back at some of my very early posts and it got me thinking…has the time come to look back at some old recipes, make some adjustments and post them again in their new and improved form? I’m a better cook and baker these days, so it’s quite a fun way to see how far I’ve come and what I’ve learned. So you can probably expect to see quite a few more of those to come over the course of this year. Ah, those early posts. Back from when I first dipped my toe into the blogging world. You can tell those posts. The writing is enthusiastic, but more tellingly the pictures are not quite as polished, and in particular I had not yet discovered the “flat lay”. It sounds positively risqué, but this is apparently just the technical name for setting things out on a table and then photographing them from above. You’ll probably know it as the look that is so beloved of Instagram influencers who probably spent ages making things look as if they have been effortlessly thrown onto a table. And back in the day, I was also muddling through with a more basic selection of kitchen equipment, so whatever I came up with was inevitably a little more simplistic. Put another way…I was not buying new pans, trays and moulds on a whim, and I didn’t spend as much time hunting down quirky ingredients. 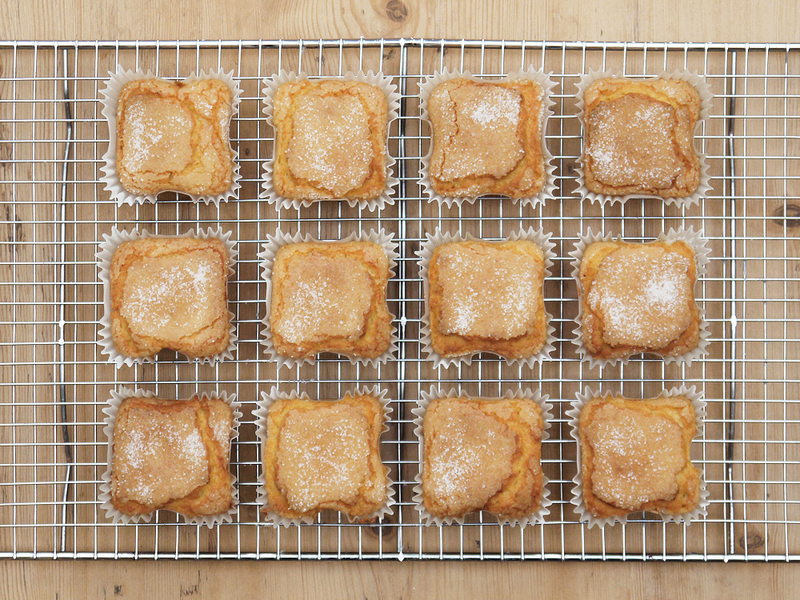 These cakes were actually inspired by a visit last year to visit some friends in Estepona on the Costa del Sol. They had a lovely garden overlooking the sea, but the real highlight for me was the orchard. Avocados, mandarins, lemons, kumquats…all ready for the picking. It rather puts my solitary redcurrant bush to shame, although my garden did come good last summer with enough fruit for two small jars of jelly. But I managed to come home with a large back of kumquats and mandarins which were turned into marmalade, and we finally got to enjoy the last jar over the festive period. It got me thinking that I really do like citrus flavours, and I wanted to have another go at magdalenas. My previous attempt at magdalenas was way back in 2010. What were you doing back then? It is just crazy to think how much things have changed over that time. Anyway, that old recipe was based on equal weights of eggs, sugar, flour and olive oil. This time I’ve adjusted the recipe slightly – I’ve used large eggs, and added a little more flour and some baking powder to get some extra lift in the batter. I’ve also added a little milk to make the batter smoother, with the hope that the magdalenas will be a little more airy. Finally, I also made two flavour tweaks. First, the lemon zest is enhanced by a little vanilla extract. Second, I have used mostly ordinary (non-virgin) olive oil, with a couple of spoonfuls of extra-virgin oil for flavour. I find that on its own, the extra-virgin stuff can make cakes a little bitter and grassy. Of course the other big change this time was that I was able to bake my magdalenas in a square shape, like they often do in Spain! 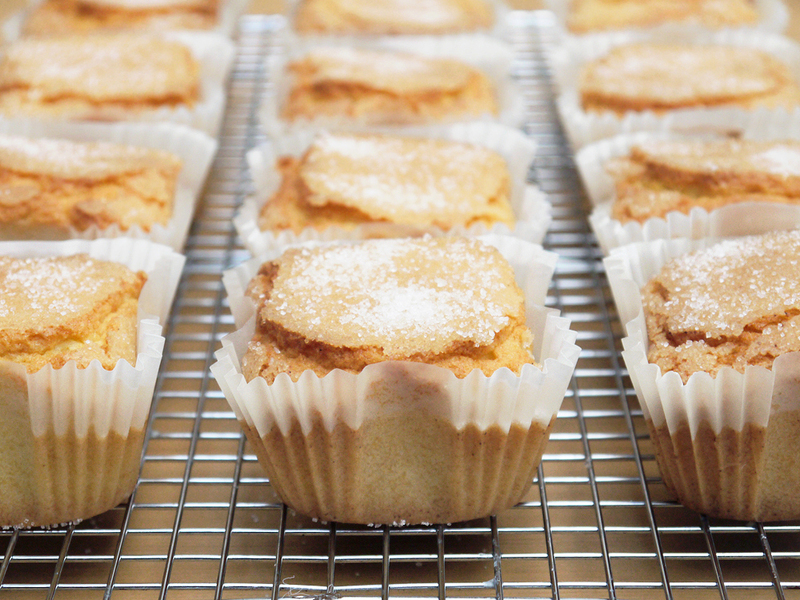 Luckily I just happened to have a square muffin pan that I bought a couple of Christmases ago to make another Spanish delight, the almond-flavoured marquesas de navidad. When the tray appeared in the kitchen, I was promptly chastised for shelling out cash for yet another piece of single-use kitchen kit. This batch of magdalenas clearly vindicates my impulse purchase, and I really love the different shape. Does it add to the flavour? Absolutely. It makes them look very pretty on a plate, thereby enhancing the eating experience. The end result is a great little cake. They have a lovely light texture, so the extra baking powder and milk does the trick, and they stay wonderfully moist thanks to the olive oil. Finally, do be generous when sprinkling them with sugar – I think that slightly crisp topping is a fundamental part of them. If you were to go back to some old recipes, which ones would you want to re-make? If you have any suggestions from my back catalogue, please let me know and I’ll see what I can do! 1. Preheat the oven to 180°C (355°F). 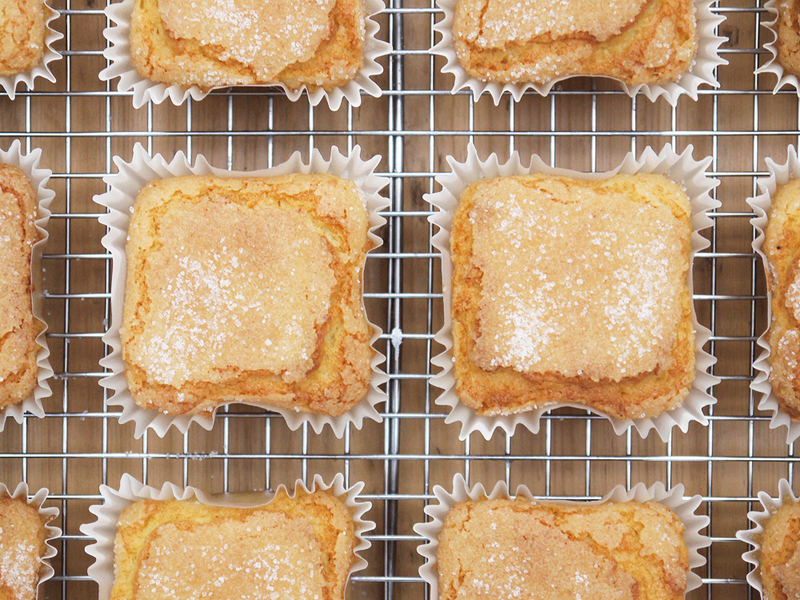 Place 12 paper cases in a muffin tray (square or round). 2. Put the eggs, caster sugar, lemon zest, vanilla and salt in a bowl. Whisk with an electric beater until light and thick (2 minutes). 3. Gently fold the flour and baking powder into the mixture using a spatula. 4. Add the olive oil and fold into the mixture (do this gently but keep going – it will come together). Finally fold in the two tablespoons of milk. You should have a smooth, soft, emulsified batter-like mixture. 5. Divide the mixture between the paper cases. Sprinkle each generously with granulated sugar. Bake for around 18-20 minutes until the cakes are risen and golden. Remove from the oven and allow to cool. Update: see my January 2018 updated version here. While LondonEats backed the Netherlands to win the World Cup, Spain emerged triumphant, and so in honour of that, today’s post features magdalenas. These are traditional Spanish cakes, said to originate from Aragon, which are eaten at breakfast with cafe con leche or as an afternoon treat. At first glance these cakes seem reminiscent of French madeleines but there are a number of key differences. Firstly, they use lemon rather than orange zest in the batter. 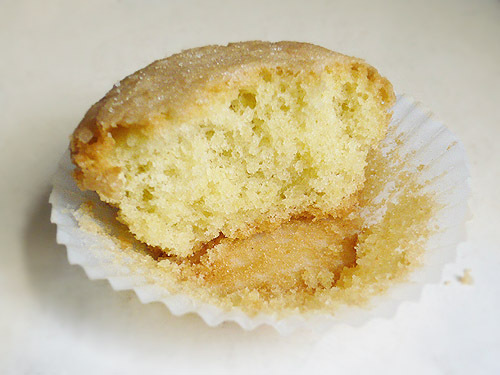 Next, they are baked in round paper cups (like mini-cupcakes) rather than the fancier shell-shape of madeleines. This means there is less hassle involved, which by now you may or may not have come to realise that I think is a good thing in the kitchen. Less hassle, not more! Finally, and most crucially, as a result of my checking some of my cookbooks, it seems that while magdalenas are now often made using butter, they were originally made with olive oil, which makes perfect sense given the role that this stuff plays in Spanish cuisine. So olive oil it is. With this knowledge, I hit the kitchen and followed a recipe which based on equal weights of eggs, sugar, flour and olive oil. This might sound a little bit familiar to regular readers (the basic quantities of the Victoria Sponge anyone?). I find it interesting that essentially the same ingredients combined in a different way can yield such different results. Just shows that what you make can depend as much on what you make as what you have to hand. The recipe I have used also closely follows the method I use for making madeleines, so again, interesting to compare how the use of different ingredients affects the final result. How were they? Fantastic. I don’t know how authentic they are compared to what you can get hold of in Spain, but they had a delicate lemon flavour and aroma, and the oil means that they are very moist. The crumb is not as fine as for madeleines or a sponge cake, which again is probably due to the oil, but they are waaaay more aromatic. I used extra-virgin olive oil, so the flavour was subtle rather than overwhelming. 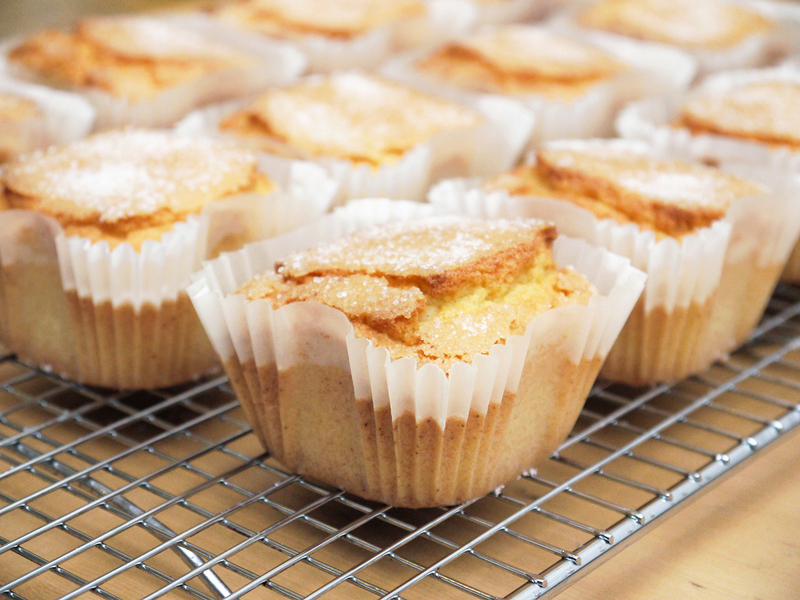 I also sprinkled granulated sugar on the cakes before cooking, so they formed a crisp, sugary crust on top. All in all, delicious and different. (*) Weigh the eggs in their shells, and use the same weight of sugar, flour and oil. Put the eggs, caster sugar, lemon zest and salt in a bowl. Whip for 5 minutes until the mixture becomes light and thick. Sift the flour. Add to the eggs and stir lightly with a spatula until combined. Add the olive oil (or cooled liquid butter) and incorporate using a spatula. Let the batter rest in the fridge for 2 hours. Preheat the oven to 180°C and line a muffin tray. Place spoonfuls of the batter into the paper cups, lightly shake the tray to smooth the batter and sprinkle over some granulated sugar (be generous). Bake for around 20 minutes until the cakes are risen and golden. Remove from the oven and allow to cool. Worth making? I LOVE these! They take no longer than 10 minutes to make, but they are utterly delicious. Fragrant, moist and delicious. ¡Viva España!